Randy Kaplan never leaves home without at least half a dozen brand new, official major league baseballs and one wooden Rawlings baseball bat because, he says, you never know who you’re going to run into. Kaplan has collected over 300 baseballs signed by various world leaders including Margaret Thatcher, Barack Obama and Panamanian President Juan Carlos Valera. Several of these signatures have been collected through Kaplan’s own chance encounters with important people. He got President Obama’s signature one night after running into the President smoking a cigarette outside of Capitol Hill while he was still a senator. 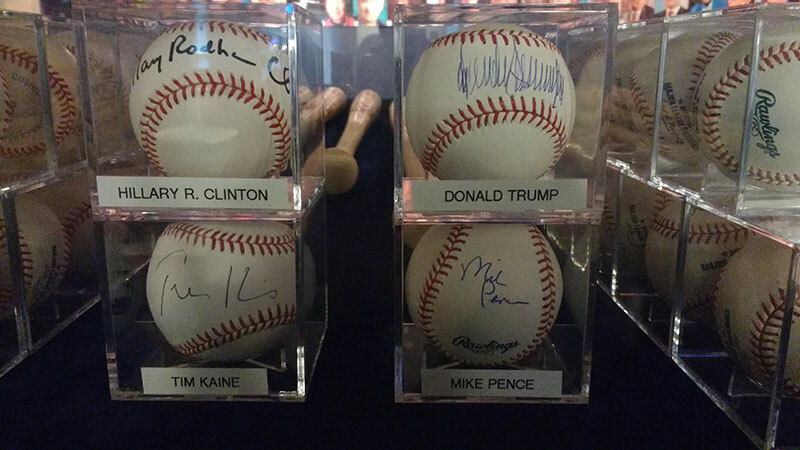 There are 181 of his baseballs on exhibit in the Cradle of Aviation Museum, with a spotlight on balls signed by nearly every contender from both major parties in this year’s election, including signatures from Donald Trump, Bernie Sanders and Hillary Clinton. While one-of-a-kind, Kaplan’s baseballs are among many collections of political items. One of the biggest independent manufacturers of political buttons in the country and an avid button collector himself, Mort Berkowitz says the market for political items skyrockets during election years, as campaign materials such as buttons and posters flood the market and collectors try to get as much as possible. “During this year, I already designed over 900 different styles and buttons for all the candidates running,” Berkowitz said. Berkowitz specializes in comical and over-the-top button designs. His favorite design this year features a picture of Trump, his famous golden pompadour photoshopped to outrageously large and unruly proportions. Under the picture are the words, “We shall overcomb.” Berkowitz says Trump is his most popular seller this year with over 18,000 Trump buttons sold. Election years are the most popular time for people to take up collecting. Lance Miller started collecting Bernie Sanders memorabilia this year, and joined the national American Political Items Collectors Club (APIC). Political Memorabilia isn’t just a nice momento for supporter, it can also serve as a simple and effective tool during campaigns for candidates to promote their ideals. Kennedy served on a PT-109 that was rammed and sunk during World War II. Despite his resulting injuries he managed to swim himself and another survivor three miles to safety. Kennedy was awarded a Naval Medal of Honor for his actions and the PT-109 pins were a representation of the young candidate’s toughness and bravery. These pins can be bought for around $40 on Mongeau’s website. While most items in political memorabilia collections are bought and are often sold or traded. Randy Kaplan has never purchased a signed baseball. All of his signatures were collected either by himself or with the help of colleagues, and he hopes never to sell his collection. “The Kaplan Collection” will be on display at the Cradle of Aviation museum in Garden City until Election Day, November 8, when Long Island and the rest of America will hit the polls to choose America’s next leader.